I mentioned this holy grail lip product in my previous post about my favourite lip treatments but I don't think that all of the amazingness of this product could be contained in such a small mention - so I've decided to dedicate an entire post to the Fresh Sugar Lip Treatment SPF 15. 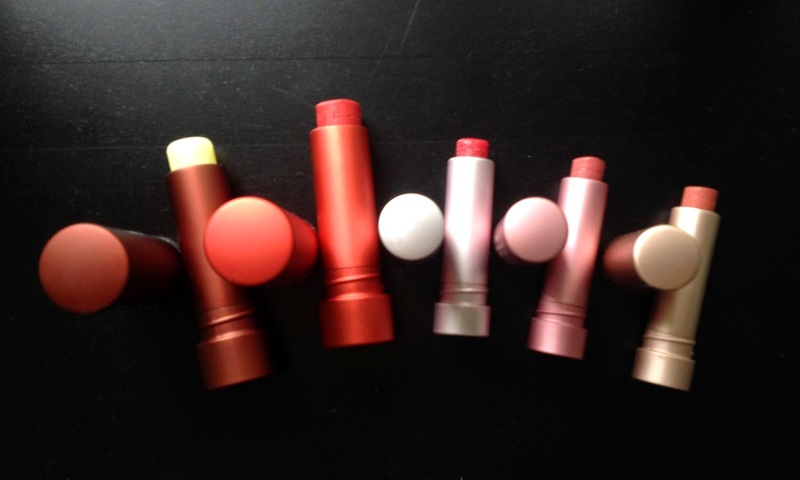 Fresh Sugar Lip Treatments are smooth, silky lip balms that apply like a dream. They are very soft and almost melt onto the lips. They feel very luxurious and you can feel them well into the day. They do sort of hover on the lip, rather than sinking in completely, but I prefer this formula since it creates a strong barrier between the lips and the environment, keeping them plump and protected all day. They smell faintly like sugared lemon which is just heavenly. They also have SPF 15 to protect your pucker from the sun. All of the shades in this product line have the same sophisticated packaging, just in different colours. The tubes are metal and quite strong but sleek. The lid twists onto the base, preventing any slips or mishaps that can ruin your purse or the product. 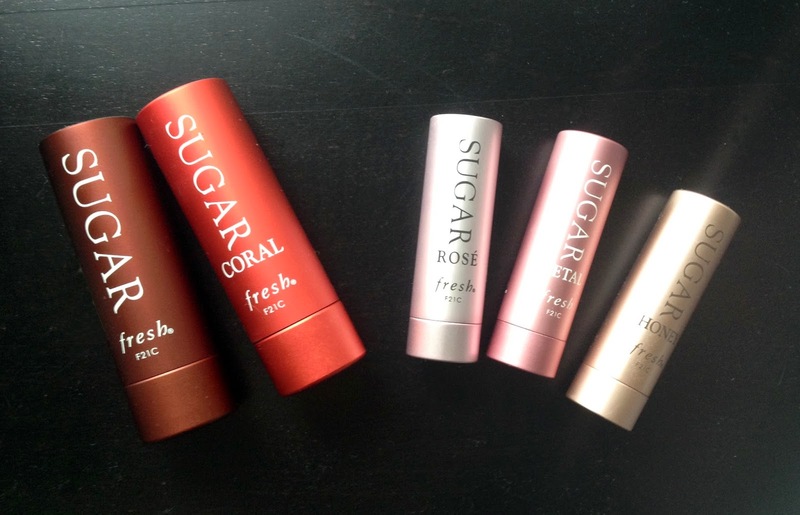 The original Fresh Sugar in its classic bronze packaging is what I use every single day. It's a plain, clear, trustworthy balm. Fresh Sugar Coral comes in a bright coral red tube. It is one of the more pigmented ones in the line and applies a shiny red coral shade on the lips. 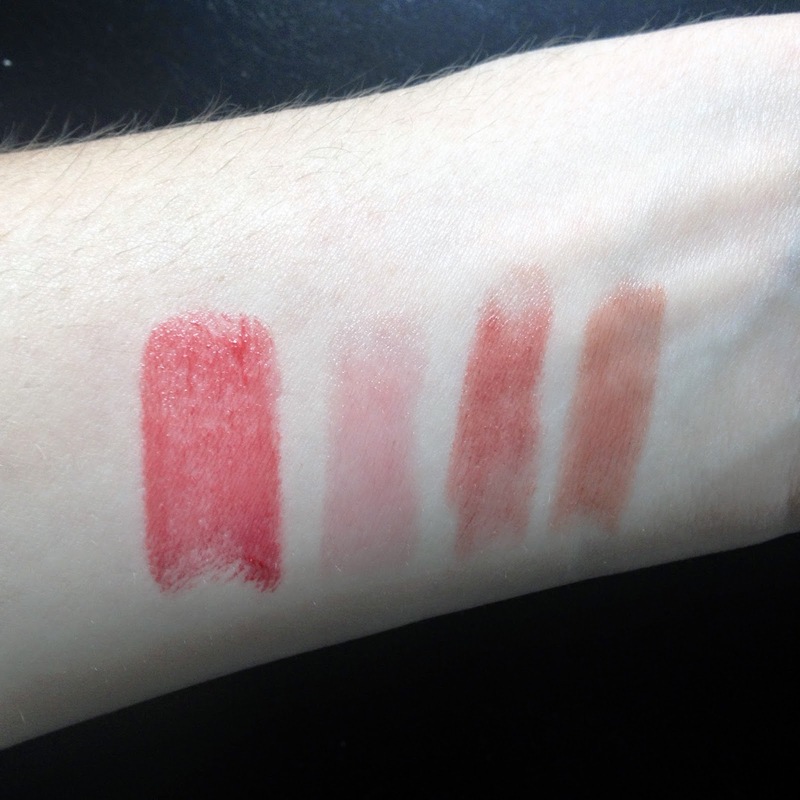 It is more like a lipstick than a sheer balm in the colour department but it maintains the silky balm feel. I love this for summer. Fresh Sugar Rose is one of the sheerest tinted balms and applies a sheer rose red. I love this one on an everyday basis as well, the hint of tint really livens and awakens the face. I've gone through a couple tubes of this one. Fresh Sugar Petal is a mauve-toned dusty rose that is more opaque than Fresh Sugar Rose but more neutral. This one is pretty and simple, can't go wrong with it. Fresh Sugar Honey is a brown-based neutral that looks lovely with heavier eye makeup. It's not heavy or opaque so it never looks "dead" or "concealer lippy". It's a very easy to wear neutral brown. I have yet to try Sugar Tulip (VIB exclusive), Cherry, Passion, Berry, or Plum but I plan to add them to the collection ASAP.